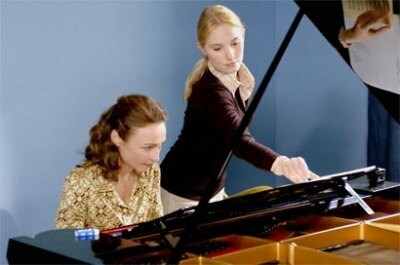 Ten-year-old Melanie is an aspiring pianist (Deborah Francois, L'enfant) whose dreams are crushed when an important audition goes terribly wrong because of a senseless jury member. Years later, with plans for a prosperous career in music abandoned, the young girl takes an internship at a prestigious law firm whose top attorney (Pascal Gregory, Gabrielle) is the husband of the juror responsible for the traumatic final. Melanie quickly becomes part of the attorney's family and agrees to assist Madame Fouchecourt (Catherine Frot, Cavale) as a "page turner". Perhaps because I spent most of my life performing on stage, solo and as a member of a wind quintet, Denis Dercourt's La Tourneuse de Pages a.k.a The Page Turner (2006) struck a familiar chord with me. Pic's quiet examination of fears only musicians can associate with felt painfully familiar, at times even banal. Yet, I could not stop admiring the professional eye of Denis Dercourt. From the opening scenes where the audience is given the opportunity to witness Melanie's collapse to the sinister transformation the girl is seen undergoing later on The Page Turner felt incredibly real. Structured as a psychological thriller pic quickly becomes committed to the predictable clash of egos between Madame Fouchecourt and Melanie where the two play a proverbial game. It is obvious why Melanie gets closer and closer to her new employer as it is evident what will cost Madame Fouchecourt her sanity. The Page Turner never shies away from the heavy presence of revenge, on the opposite it exploits it to the fullest. Still, The Page Turner is not to be classified as a revenge-thriller. Because of its nuanced characters and subtle psychological analysis Dercourt offers pic becomes far more interesting if seen as a study of the performer's mentality - balance, stage fright, sense of control, are all convincingly addressed throughout the film. If seen strictly as a story of revenge however The Page Turner will partially disappoint given its intended lack of suspense. The methodical pacing also seems to reiterate the fact that a much more complex read is needed here, one that likely many won't have the patience to endure. In 2007 the film was nominated for Cesar Awards in the following categories: Best Actress (Catherine Frot), Best Music (Jerome Lemmonier), and Most Promising Actress (Deborah Francois). The film was also a part of the official selection at the Cannes Film Festival. Presented in its original aspect ratio of 1.85:1 and enhanced for widescreen TVs this R1 produced disc appears to be a PAL-NTSC port. There is plenty of "ghosting" here and it should be quite easy for you to notice its disturbing effects. On a positive side this is a very clean and free of damage print. Contrast is also tolerable while the color-scheme appears in excellent condition. I ran a few quick tests with my R2 disc and truth be told if not for the improper conversion there really isn't much one could be dissatisfied with. It is a shame that Tartan USA never managed to resolve this issue. In the audio department this presentation is nearly flawless. The disc offers a very strong French DTS track which brings out the beautiful classical score quite well. There is plenty of activity in the rears while dialog is addressed professionally. I did listen to the French DD track as well (just to compare how the two match) and no doubt there is a great difference you will immediately notice. There are no audio drop-outs or hissing(s). With optional English and Spanish subtitles. Aside from the original theatrical trailer and a gallery of trailers for other Tartan releases there is a standard "Making Of" titled Composing the Page Turner which offers some in-action footage as well as a few sporadic comments by the cast and crew. Unfortunately, the piece does not go in-depth providing further information regarding the message behind the story, the complex characters, or the manner in which the film resonated with both critics and viewers. A film of substance with a storyline allowing for multiple viewing angles The Page Turner is without a doubt a success. Pic's realistic depiction of the brittle world of musicians is flawless. If looking for the best version of this film you must opt for the UK disc, if not region-free I strongly suggest that you add The Page Turner by Tartan USA to your collections.